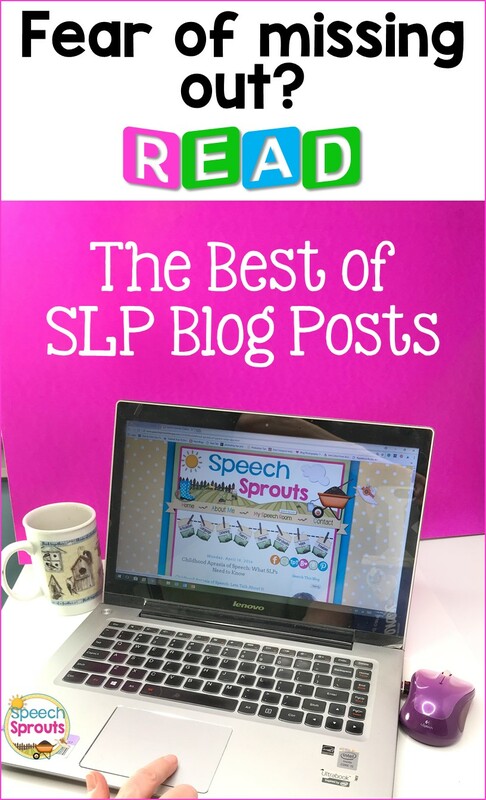 Are you missing out on the best of SLP blog posts? It's terrific that there are so many SLPs out there sharing their expertise, insights, ideas, and resources. But that's just it... there ARE so many! In the last few years, speech and language blogs have exploded. You can't possibly read every single post out there, I know how busy you are! Everyone has their favorite bloggers, but you may be missing out on some truly terrific content by others. 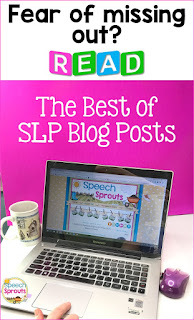 What if you could find the very best SLP blog posts... in one spot! 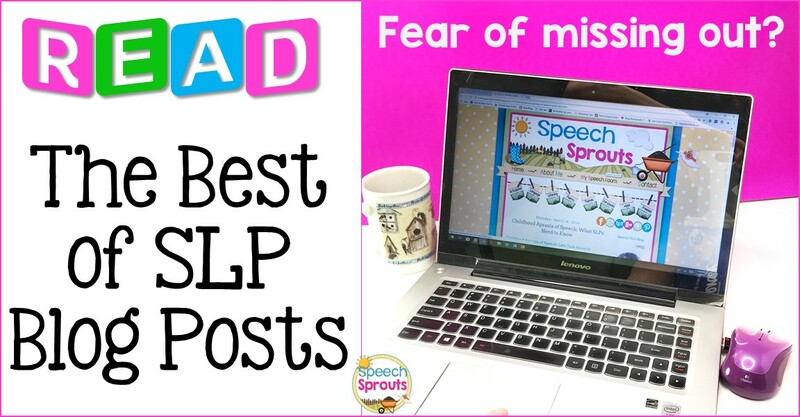 I asked some of my SLP blogging buddies to share their most popular, truly awesome, most-proud-of posts from the past 2 years, to make it easy for you to find that must-read content. Take a look, have you missed any of these? I hope you find it's a treasure-trove of SLP goodness! I had sooo much fun reading these posts! Pin and bookmark this blog post, and come then back when you are ready to read more. Any other super-fabulous posts you'd love to nominate? Tell us in the comments. Happy reading! Want to learn more about AAC? Pretty simple, certainly low-cost, and easy enough for anyone to implement, right? Actually no. Read about the mistakes I've made (and you can avoid!) teaching communication interchanges using PECS. I was honored to have this post quoted in the ASHA Leader this year! How can you add more AAC and communication opportunities for students with multiple challenges? From incorporating AAC in story time, adapting symbols for children with cortical impairments, choosing switches, or making large, classroom-sized communication boards, you'll find great ideas in this post! Susan talks about why incorporating shared reading and discussion is so important to build background knowledge for literacy skills and shows us how to go beyond the typical "what" questions by providing a robust vocabulary in a child's AAC system. If you haven't read my series on CAS, this is the post to start with. I share the information I learned from the amazing Dr. Edythe Strand. I promise you'll come away with a deeper understanding and strategies too. It's a must-read! What are mirror neurons, and what does that have to do with articulation therapy? If you are a bit of a science geek like me, you'll want to read this post to find out! Don't forget to grab Lindsey's freebie handout for parents on the importance of having a child "watch me". Take a peek at Ashley's favorite book suggestions for incorporating stories with R practice. Have you read The Horse in Harry's Room? While you're there grab a free download. Thanks, Ashley! Seven things you can do with those frontal lispers who will just NOT generalize. Have any of those? If you love organization hacks, you'll want to see how Ashley turns a craft storage container into a color-coordinated masterpiece! Make your own labels or purchase labels to match your favorite colors. Easy Peasy! I have to admit it- progress reports are one of my least favorite chores! See how Mary uses Google Drive and Google Sheets to keep data and give you those averages at lightning speed when it's progress report time. Handling large-group make-up sessions is a challenge. Viola shares some great ideas for group activities that will get everyone engaged. Jennifer shares how using speech therapy folders keeps her organized and saves her sanity! If you want to give it a try, be sure to download Jennifer's freebie while you're there. Plan to get your students moving? Collette shares how to use communication temptations, target requesting, turn-taking, following directions, expanding sentences and more using every child's favorite toy. Bounce one in your next session! Have some speech-on-the-go fun with these five hallway games that will turn travel time into therapy time! Preparing to up your assessment game? Learn how you can find out a plethora of information about a child's language skills using a simple language sample. Be sure you download Collette's handy form to help you analyze your next language sample- the link to this great freebie is at the end of her second point. Many school-based SLPs are discouraged with their work environment. We see many posts on social media talking about job burnout and dissatisfaction. Read Mary's advice from the trenches on how to make things go better when you are feeling "stuck". Have you heard some of these? Whether you agree with each point or not, this post sparked plenty of healthy discussions. Get ready to advocate and educate. Unfortunately, a huge challenge for SLPs is that we're super-busy and time-stressed. How do you take care of yourself when trying to keep up? Read these important reminders and tips, then resolve to put a few in place! I know I have major fear of missing out when ASHA is coming up. Kim talks about her decision to skip ASHA for the first time in seven years, and why it's really ok. What do you think? The Importance of Work-Team Relationships by Laura of All Y'All Need. Do you work as a licensed assistant or supervise one? Read Laura's 5 tips for relationship-building and making a great team! Gathering resources for parents and teachers? A terrific post with wonderful, easy-to-understand language development suggestions for parents of young children that can be implemented on the playground or when cuddling with a storybook. Refer your parents to this one and check out Darla's book suggestions... I know I will! This blog is written by a dynamic UK husband and wife duo. They packed this post full of practical suggestions for increasing comprehension in the classroom. You'll want to share this one with your classroom teachers. Another UK duo is behind this blog. Read and share how parents can practice and keep their children motivated. Ready to boost those language skills? Did you know that high-performing students know about 2x the number of words as low performing students? See where SLPs can focus to have the greatest impact. And don't forget to download Mia's Tier II freebie to get you started. You'll love this colorful jumbo straw sensory bin and tips for eliciting plenty of language while playing "I Spy". Felice has you covered with a free download for you to use with your next bin! Allison loves barrier games for learning language skills, walks you through how to use them and has great suggestions for using toys in barrier games too. She has a free barrier game download for you too! Brushing up on therapy skills and approaches? If you're playing card games the traditional way, you may find that some of your students get frustrated. Laura shares simple strategies to fix that and shares great tips on how to make the most of language learning while playing games. Have you heard about the "scream study?" Learn why the traditional prescription of vocal rest may not be the most effective approach in your repertoire. Instead of barrier games, how about barrier stories? Kim buys her magnet sets in pairs. Read how she tells a simple story as the scene is constructed, targeting listening and language! You'll love Helen's ideas for group listening games, and your students will too! Have you played Potato Salad or I Went Shopping? Working with children with autism? Do you wonder where to start with some students? Learn why joint attention is KING and watch the video Joint Attention Test. Find out how to speak less and play more to establish the basis of communication! Mandi shares why a visual schedule during therapy sessions can benefit any student and shows how she uses them. Grab a free session schedule and first-then board while you're there! Pondering social skill development or play skills for students on the spectrum? Is it that your student needs direct instruction to be taught the skill, or just needs more practice? Donna shares how to approach different needs and teach the vocabulary to go with it. Do you have students with high functioning autism that are very verbal, but don't know how to have a give and take conversation? Heidi breaks down the skills we can be looking for and working on. I bet you've seen work jobs used in structured teaching. But how about using a shoebox to visually sequence play skills? I love this social skills idea and Linda shows you step by step how to set it up and use it. If you're ready to work on changing echolalia into more functional language skills, you MUST read this post! Linda shows you how to use visuals, scripts and repetitive books and gives plenty of tips along the way. Read my round-up of terrific storybook suggestions by the SLPs at Speech Spotlight. Will you find a new favorite? I did! Grab a terrific book and use it across your caseload! Hallie shares plenty of ideas and strategies for addressing goals with books in therapy. Considering Volunteering Your SLP Skills Abroad? SLP on a Mission... A Look at My Trip To Honduras by Kristen of Talkin' With Twang. Kristen did just that... and shares her experiences with us. Read about her work with the students of a Christian school and a special little girl named Elsi who happens to have a cleft palate. How About Using Videos in Speech Therapy? Did you know Sesame Street has a library of social-emotional videos on YouTube that you can use? Read how Heidi incorporates the video The Biscotti Kid to teach whole-body listening. Awesome! I hope you enjoyed this list, and maybe even found some new favorite SLP blogs to follow. Pin & share with your slpeeps! Please share this list with your SLP peeps if you enjoyed it! What topics would you most like to read and learn about and in the coming year? Leave your suggestions, because I'll bet there is an SLP blogger with just the expertise you are looking for who would love to share. Amazing round up of posts! Thanks Ashley! I may be trying your cards bin- it turned out so cute! Thank you for this comprehensive list!!! Great post, Lisette. I love how you've aggregated so many topics int one post. You have covered so many important areas! I'm grateful to be included with such a fantastic group of bloggers!